Community members from the remote mountain village of Bolgaon meeting with CARE to discuss their most pressing needs. Immediately after the earthquakes, CARE distributed bags of lentils and rice and other emergency supplies. CARE was there to help immediately after the earthquake hit - and we are still there to support people to rebuild their lives and livelihoods. More than 600,000 houses were completely destroyed by two devastating earthquakes in April and May 2015. Nearly 190,000 people were displaced and 2.8 million saw their livelihoods affected. 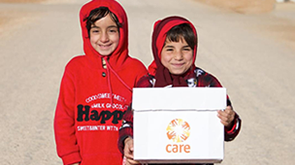 CARE was there on the ground from the moment the first earthquake hit, providing immediate assistance in the form of CARE packages, shelter, food, water and sanitation, and working to distribute emergency supplies to remote communities where help was most needed. More than one-quarter of CARE’s earthquake response in Nepal was funded by donations from the UK public and by grants from the UK Department for International Development. Thank you so much for your support. A regular gift to CARE means we can be there to help people whenever and wherever disaster strikes. 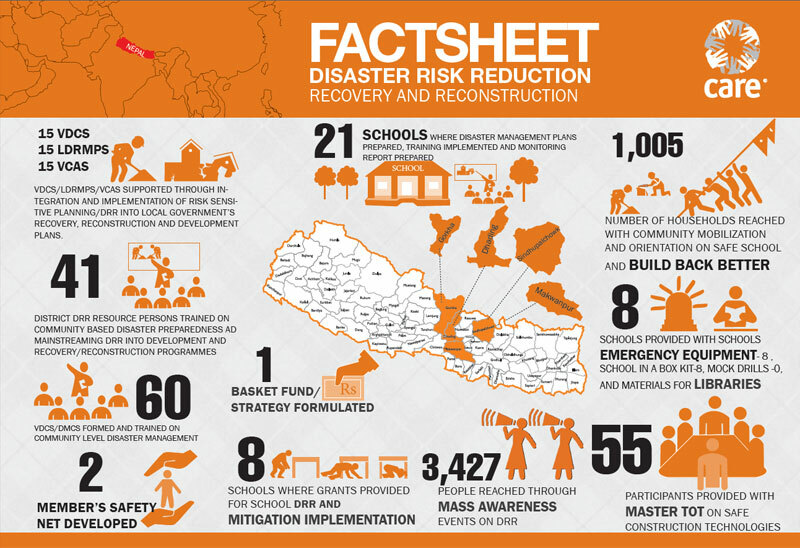 Download our factsheet showing the impact of our emergency response, two years on from the first earthquake on 25 April 2015. The factsheet shows how CARE has helped people with shelter and building back safer; water, sanitation and hygiene assistance; food security and livelihood recovery; tackling gender-based violence; and being prepared for future shocks and disasters. A 7.8 magnitude earthquake struck Nepal at 11:46am on 25 April 2015. The epicentre of the earthquake struck in an area between the Nepalese capital Kathmandu and the city of Pokhara. A second major earthquake centred to the north of Kathmandu brought even more devastation when it hit two weeks later on 12 May. Nepal is a country at high risk of earthquakes, and experts had long been warning of the impact of a major earthquake near Kathmandu. The mountainous terrain and limited road network – much of which was severely damaged by the earthquake – mean it is a major challenge for relief agencies to get supplies and assistance to those who desperately need it. CARE had been anticipating an earthquake like this for a long time, and processes and response plans were in place before the earthquake hit. In fact, CARE Nepal held an earthquake simulation and emergency planning workshop just two weeks before the first devastating event. CARE’s emergency specialists from across the world joined our team of over 150 local staff in Nepal to deliver CARE's emergency response to the most remote and worst affected districts. We provided 14,000 women and adolescent girls with emergency health services and constructed and equipped two new community health centres. We raised community awareness about gender-based violence through radio, print and community drama activities, and referred 450 survivors of gender-based violence to protection services and case management support. Nepal has one of the worst maternal mortality rates in the world (170 per 100,000 births), and our previous experience shows that this goes up following earthquakes and natural disasters. Hospitals and medical clinics are overwhelmed helping people injured in the earthquake, while damaged roads mean women can’t access medical support. To help meet the specific needs of pregnant women, new mothers and children, CARE focused on distributing water purification treatments to provide clean water for pregnant women, new mothers and children; family hygiene kits including sanitary items and nappies for newborns; and distributing food to ensure pregnant women, breast-feeding mothers and children continue to get the nutrition they need at a critical time for them and their babies. In crises like this, the risk of sexual violence and exploitation increases, especially for women and girls. Even in normal times, rates of domestic violence in Nepal are high: 22% of women between 15-49 experienced physical violence in the past year and 12% had experienced sexual violence since age 15. CARE’s emergency response prioritised the protection needs of women and girls.